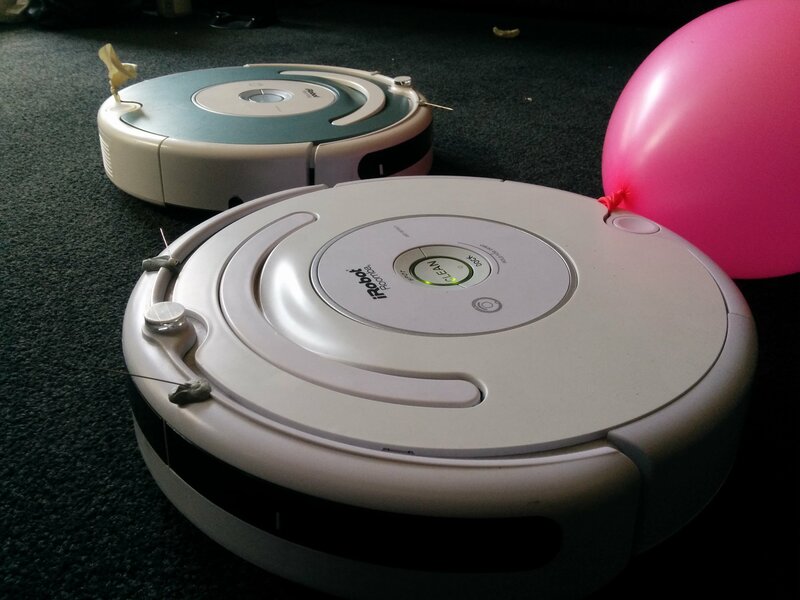 I had a friend over for post parmigiana coma today and of course, as is often the case, the silliness took hold and we ended up setting the Roombas on each other. This worked out much better than expected. Off with the knife, on with the horns. 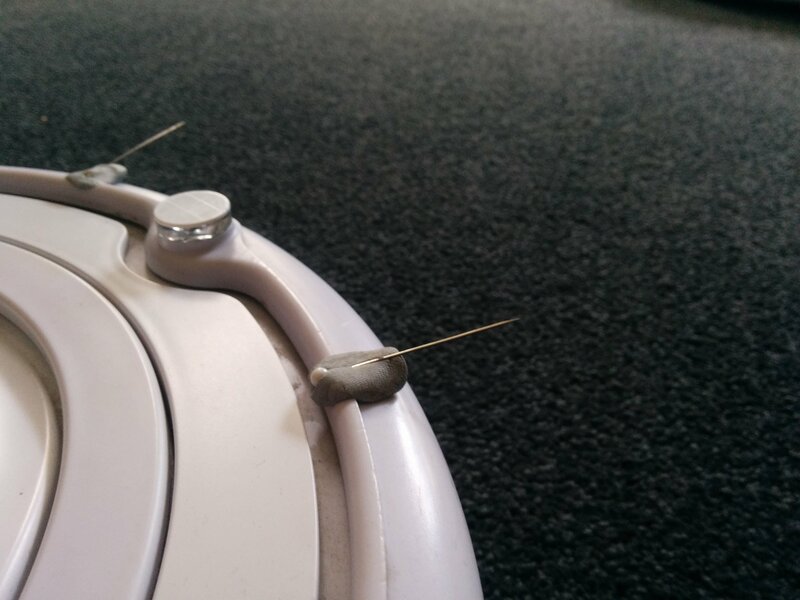 Some blue tack and pins seemed like they’d be more effective and less complicated than the whole knife idea. 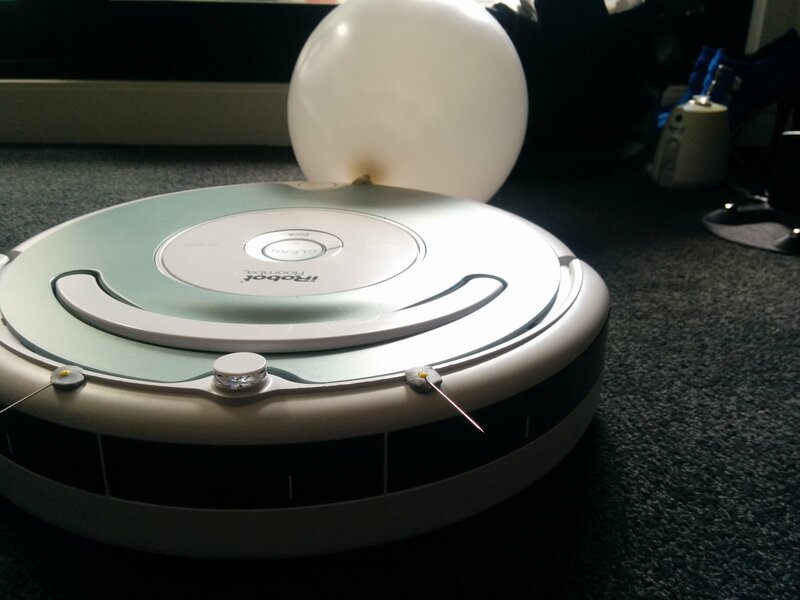 After attaching the balloon to the tail, it felt more like bull fighting than robot fighting. This actually looked quite good and seemed as though it would be more effective than the knife. I had thought the whole thing would be over a little too quickly. Especially since I’d been too lazy to set up the 4 infrared walls properly and instead opted for the triangle of death. This failed miserably as you will soon see. The Roombas ignored the black tower and started running over it and proceeded to drive the pins into my couches and attack me on occasion. Due to the blue tack being left in the sun prior to application it bent the horns a little and between straightening them up and fending the Roombas back toward each other, my friend and I found ourselves on the receiving end of the horns a little too often. I would have felt in less peril had we opted for the knives. Anyway, excuse the worlds shakiest footage but I hadn’t really planned to do this, onto the fight! Surprisingly they came so close and so often I couldn’t help but be a little excited. As you can tell by the climactic explosion and girly scream, which I swear was not me, we have a winner and a confirmed kill. So it seems the arena is over engineered and I kind of like the bull horns more than the knife. It worked quite well with the randomisation of the clean cycle and kept the suspense going quite well. So going forwards, that’s what we’ll be going with. 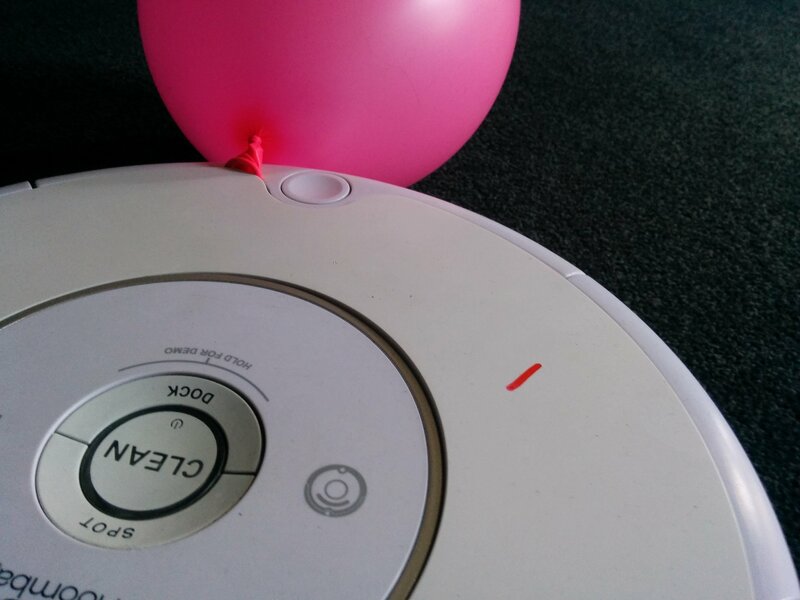 You could put smaller ballons instead of a big one. It might make for longer battles.